Moneli Golara qualified from University College Hospital in 1991 and has been working in Obstetrics and Gynaecology ever since. She completed her training in hospitals across London, working in many centres of excellence such as Queen Charlotte’s, Guy’s and St. Thomas’s and Chelsea and Westminster Hospitals. She gained her MRCOG in 1997, and FRCOG in 2010. Her main areas of interest are Fibroids, Menstrual problems, keyhole surgery, contraception and hormone replacement therapy, gynaecological problems in teenagers and other general gynaecological conditions. 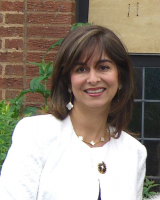 She currently works as a Consultant at Barnet Hospital, Royal Free NHS Trust in North London and delivers a high standard of clinical care to her Obstetric and Gynaecology patients. During her training, she also undertook 2 years in clinical research, mainly in conditions such as pre-eclampsia and prematurity, publishing many peer reviewed articles in relevant journals. She contributed as an expert to a comprehensive pregnancy book 'My Pregnancy', published by Dorling Kindersley in 2011. Regularly gets invited to North London GP practices to give lectures and has also been invited to travel abroad with Conference Plus to give talks in their conferences. The talks are well received with very good feedback.